CAMPGROUND CLOSED as a military campground. The campground is now operated by a private company and is open to the public. This was our maiden voyage in our TT. The couple, Pat and Pat,who manage the campsite were nothing short of phenomenal. They were so helpful at every turn. The campsites are clean and well maintained. There's not a lot to do in the park overall,however the new Beach Club was just opening that weekend and seems to have a good draw of patrons. The old board walk spans the coastline and goes on for miles. This provides a great place to jog, run, walk or ride a bike. Be careful walking around the campgrounds as there are many, many, many "sticker burrs" in the grassy areas. Our dog picked up a few and they are very painful, so be careful allowing your pet to walk in the grass. Overall, we had a good experience and plan to visit this campsite again and again as it is very close to where we live and provides for a quick get away. The Park is reopening this weekend. 07/06/2012. It will be privately run and the staff is working real hard to make your camping experience wonderful. Give it a try. Arrived on a Sunday. Office is closed on the weekends, but sign in window told us our site number. Sites are well spaced, but as said before, all hookups located at the back of the site. Would have given a 5 in the cleanliness/hospitality, but when we checked in on Monday found the office staff stand offish and not very friendly...Someone could have at least cracked a smile....Pet walking is limited to way over on the other side of the office building...don't know of any dog that can wait to walk the length of a football field to pee....On the positive, beautiful views of the bay and ocean and the Dog Beach is great for the 4-legged kids...lol..Maybe the attitude is due to the fact that all services are being moved over to Ft. Eustis because of the closing of Ft. Monroe....What a waste as this post is well laid out...and the loss of Military History for the the Army is a shame....So, please, if you can do it, come visit and enjoy this historic fort before it closes. Campground to close August 15, 2011 and the Post September 15, 2011. We had about 4 straight days and nights of rain, plus 2 days and night of off and on showers, during our stay. While the RV park is nice when dry, it is a pretty miserable place when wet as drainage is non-existent. We had to wade a few inches water to get in and out or our motorhome (our booster step floated away...), but we noted several occupied sites that were literally swamped in 6" or so of water the entire time we were there. There were some wood pallets on some of the worst sites to give the occupants some help getting in and out, but I had to wonder about swamped sewer hookups and electrical connections. I installed a new water sediment filter on arrival ...the filter normally lasts 3 months, but I had to discard it after one week due to the severe rust in the water. The office staff is hopeful (I am too!) that the campground may be kept open by the National Park Service when they take responsibility for the historic areas of the fort in 2011, but nothing is sure about that possibility as yet. We camped here in a 40' 5th wheel and it was our 2nd time to stay here. This time however, the only sites available were in overflow ($17 a night for water/elec). The price seems a little high for what is available in amenities (1 washer/dryer & borderline cleanliness of the shower/restrooms). Although I rated the park lower than usual, it did make up on the overall location. Our family spent every night walking along the beach and enjoying seeing the abundant wildlife. It is too bad the park is closing next year. With a few upgrades to the sites, restrooms and having a full time campground host, this would be a fantastic park. Just visited for quick weekend outing with our new 2010 Jayco Jay Flight travel trailer. The location is close to very historic and interesting Fort Monroe. If you visit this campground before the base closes, take the time to visit the Casemate museum. You will be glad you did. The bathhouse is adequate but small. There is only one restroom for both males and females. It's kept pretty clean, just you have to wait if somebody is showering, etc. We asked the personnel at the campground what happens to the campground once the base closes and they said they believe the campground would close as well. So, if you have the time, check out this gem before it is gone! We stayed here for a week and except for the occasional holes in the ground that we ended up marking with lawn lights it isn't bad. The staff was very attentive to problems and the neighbors were friendly, not like a lot of military RV parks. We also noticed that there were not a lot of active duty, again like most are going (changing from trailer parks to RVs for active duty). The only problems were that the ocean is not accessible from the park unless you want to walk a long way, the beach is off limits by the park, and in order to get to the beach you have to drive because it is chain link fenced off. This park will be missed when it is BRAC'd in 2010 along with the post. Nice little park, sites all level and black top. Great staff. The base PX is small and closes at 5 and gas station/C store closes at 6. If you need ice it is off base after 6. Cute little village "Phbous" just outside of gate artsy/crafty type place, like stepping back into time. As reported in earlier post bath house is one man and one woman. Toilet and shower in one big room, so if someone is using it, your out of luck. But did not pose a problem for me. Very clean and lots of hot water. RV shower are not for me, to little hot water. Only real complaint was we arrived on Wed and grass needed cut badly, not cut it until following Mon. Tall grass and bug that bite go hand in hand. Told the environmental folks were doing a study to see if the could spray for bugs. What has happened to common sense? If you are visiting Hampton/Newport News/Williamsburg area or Norfolk just a short ride up/down I-64. Plan on time for seeing the Fort (real deal), largest stone fort in US. Views of the water and ships from the base are not surpassed. We will be returning. Hope to see you there. This is an extraordinary campground. Check in staff was very friendly and knowledgeable. Sites were spaced far from each other which allowed for lots of privacy. The sites were level and well maintained. Very convenient to several walking paths. We would definitely camp here again. It is too bad that the post will be closing. Great location for history buffs and seafood lovers. I plan to be there for a full 60 days as I am active duty on PCS orders on my way out of the area, so working and living and taking two small kids to school each day. Playgrounds are convenient, and it's nice and quiet. If you are expecting rain, do not take Pennsylvania. It get the most bogged down of any of the slots - not just the camper parking, but also where the car or truck sits. Slots are not assigned until you arrive, so you won't be able to request a different one ahead of time. Because the loop runs clockwise, most slots require backing in to the right rather than the left, so if you have issues with the left side blind spot, be aware. The slots inside the loop allow for backing to the left. Dump openings are situated almost all of the way to the back of the pad, so if your tank valve is close to the front of the camper/RV, you may require a longer hose - I had to buy a 20' hose. Otherwise, a nice site. It is a shame we will loose this park to it closing 2011. The location to the entrance of the Cheasapeake Bay is great to observe all shipping. I will come back again. The only negative thing is after a good rain there are locations of flood areas. My spot, South Carolina, the paved area was dry, but the grass area was swamped. Called three weeks in advance and was assured there would be a site available, called on Sunday and left a message on voice mail, still no response to that. Got in in the evening, no one around so took an empty spot. During check in in the morning was told I would have to move because someone was coming into the spot I had. I moved, no one ever showed for that spot. Three rigs in the campground while we were there. Was asked if I had a Golden Age Passport, yes in the RV, don't worry about it. Paid the bill and asked if the discount was there, No, you have to have the card with you when you check in. Other then feeling like we weren't treated the best, the views and the area are superb. Also not a good place to walk your dogs because of the pricklies on the ground. Pulled in today with 1 day notice on the reservation and reserved over flow spot #3. Just a field but area well maintained and beautiful. Have heard that the fort is on the BRAC and too bad as this place is beautiful. Overflow should be less than $17 per night because all you get is water and 30 amp. Water was turned off to the overflow and when I spoke to the office about it they got a "trouble call" put in and the water was turned on before I had my trailer dropped. Son in the Navy at Norfolk Naval station and an easy drive other than "rush hour." Will spend 2 weeks here and could get on the asphalt but will stay here. Can extend for 2 weeks for a total of 30 days but will move on. Really enjoyed our three day stay. Fantastic location for history buffs. Only negative is the sand spurs. Those little things hurt. Fantastic fishing on sea wall. What a convenient spot for discovering our Nation´s beginnings! Also for visits to VA Beach and other sites. Like the previous reviewer, I agree; Ft. Monroe´s history is great (make sure you check out the Casemate Museum! ), and it´s sad it´s closing. As for the Camp: Ft. Monroe is easy to find and get on/off, the sites are level and easy to maneuver, although somewhat narrow. There are numerous close play-areas (my kids had a blast), and the restroom/laundry is very clean. It seemed there was not a single homeseteader (first time I´ve seen this EVER). Cell-phone service and computer phone card use is clear and fast. I almost don´t want to divulge the negatives. But, so ya know; there is no commissary (one on nearby Langly AFB), no recycling (anywhere! ), and only one shower and W/D. Still, I would recommend this place anytime! 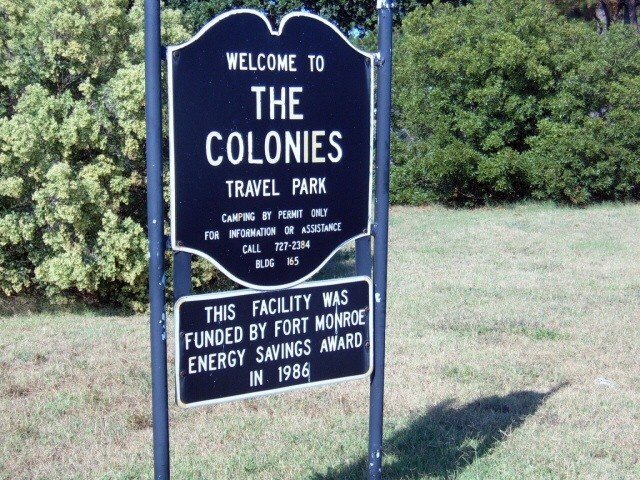 We spent two weeks at The Colonies Army Camp Grounds on Ft Monroe, VA. We loved it. Although the CG has only 30amp with S/W it is a great place to stay if you want to do Williamsburg, James Town and Yorktown historical sites. A little out of the way, but the base is a treasure trove of history itself. We are sorry to hear that the base is on the close list. We are so glad we went before that happened. We made reservations about four weeks in advance and arrived after the office was closed. There was a list on the door telling us which site to go on and that they would see us Monday. If we had any questions to see the camp host Marv. He is a great guy and answered all my questions about the base and the area. The sites are a little tight, but very nice. It is very restful and quit. After long days visiting the area historical places it was great to come home to peace and quit. If you go there make sure you save time to visit the old fort. It is full of history from the civil war on. They say it is to close in 2009. If you can, go before that happens. As was said in another review, the MWR office does not have any info about the area, but the Soldier & Family Support Center is very helpful. The only place to get on the internet is at the library, that is the only downer in the place. All in all a good time was had by all. Directions on the website are still correct. No construction. Calling ahead for reservations, I was told me that they were booked up for the next 2 months. (thru the end of Nov. 2007). I asked about the overflow sites and the "lady" came back after checking; to tell me that overflow # 3 was open. If I hadn't read in US Military Campgrounds about these, she wouldn't have volunteered the info. So, thnx for that. All of the overflow sites were open upon our arrival and stayed open for our entire stay. The parking is an open field with the hook-ups for 2 spaces on posts. Our number 3 had the post on the correct side as we backed in, but had we been number 4- they would've been on the wrong side. The overflow sites are prettier (to us) than the 13 paved, real sites. We had the Atlantic 200yds. off one side and 1 of the Chesapeake back bays 50 yds off the other. They are easier to navigate into and closer to the bathrooms too. Each single bathroom (2 total. 1- M, 1-F) contains the shower and toilet. So if somebody's showering, no toilet is available. There isn't any tourist info avail in the park office but the very nice ladies down the street at the Soldier & Family Support Center had Everything. Ask for directions there after setting up in the RV park. Not enough can be said about the Post itself. Staying here was a real honor- a virtual forced trip back into history. The Post has few big base amenities but plenty of those are close by. Langley AFB is a easy 20 minute drive. Close to all nearby attractions. I highly recommend it. Get here before it's BRAC'ed closed. Great location in the Hampton Roads area. There is no community room, WiFi or cable TV, however there are several local TV Stations you can access. The grounds are not very well maintained. The road through the campground and the sites are all hard surfaced - no mud or dust. The view of the surrounding area is really nice, especially the sunrise/sunset over the water. It is a very quiet place. Fort Monore does not have a commissary, but has a small PX and gas station. However, Langley Air Force Base is nearby with a very nice large BX and commissary. This is a small campground (13 sites named after the 13 original Colonies) on a very historic Post. It is an excellent value as they accept the Golden Age/Access Passports. The campground reservation system is not user-friendly and requires patrons to move to different sites frequently. Great location in the Hampton Roads area. The rates seem high without having a community room and no WiFi or cable, and the grounds are not very well maintained. The view of the surrounding area is really nice, especially the sunset across the water. It is very quiet there. We love the Ft. Monroe area. Nice campground, pine trees need trimmed for better tv reception, gorgeous sunrises and sunsets. But we won't go back because of what we call sand burrs. They are terrible and are all over the camp area. We couldn't even let the dog out without picking burrs from his paws. We are still picking them out of things-carpets, shoes and so on. I guess they must come from some type of grass head there. They are painful too if they break off in your skin. Still a lovely place, nice and quiet. Langley Air Force Base has a fantastic PX!! Must see.